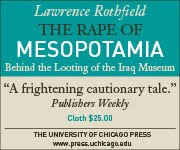 One of the myriad terrible consequences of the 2003 Iraq invasion was to give rise to a mode of archaeological looting new to the Middle East -- neither ad hoc "substinence" dirtscratching by impoverished locals, nor a side-occupation for "tombaroli" whom tomb robbing was a cottage industry or family business, but an organized crime operation: highly organized, international in scope and multinational in reach, aimed at high-end artifacts (including those in museums and on well-known sites). We know that an Iraqi gang shifted its operations to Tunisia during the tumult there, and now there is a report by an Italian archaeologist who had been running a dig in Syria that a similar group seems to be operating there. The Syrian government shut down all 80 foreign excavations, this report notes. Were the archaeologists prescient enough to have tried to develop ties to locals in previous years that might have proven helpful now as possible sources of site protection? Was such interaction even possible under the conditions of digging in Syria under the Assad regime? In any case, archaeologists working anywhere, but especially in brittle, fragile, or weak states should be thinking hard now about what if anything they could do to stop their own sites from being ruined in the chaos that accompanies armed conflicts. And, as the fighting and looting goes on in and around Syria's heritage sites, with horrific results for the sites (leaving aside the human toll, which of course is infinitely more terrible), it may be time for heritage policy to start paying less attention to sustainable preservation through tourism, whether of the World Heritage kind championed by UNESCO and the Global Heritage Fund or the little-visited-site kind championed by the Sustainable Preservation Initiative, and more attention to the less happy but arguably more critical problem of how sites can be secured when there is no state to provide security. The fact that even World Heritage sites are being shelled by the Syrian government, presumably because rebels are taking up positions in them, also points to the need of UNESCO and the international community of heritage advocacy groups to wake up to the reality that the international conventions designed to protect cultural heritage in times of armed conflict are not working well and need to be updated and strengthened. One way they might be improved, as I have argued elsewhere, would be new rules requiring countries to contribute to an international fund to support site protection efforts of all sorts, and to agree to regulate their antiquities markets (of course, a regulated market could also be taxed to generate the contributions to the international fund). Unfortunately, UNESCO itself is in no position to stir the policy pot, and heritage advocacy organizations have little clout. We may need to wait for a wealthy collector or cultural institution to provide the leadership needed to focus on this issue properly. In the meantime, the world of the ancient past is disintegrating day by day. Fake Antiquities: A Weapon against Illicit Dealers, or a Tool for Them? The paperwork would say they were all fakes. They used those to get them out of India,” a source is reported as saying.